Neurological surgery is much more than just brain surgery. Neurosurgery is a medical discipline that is primarily focused on surgically treating brain-related conditions (tumors, aneurysms, vascular disorders, and the like). Neurosurgeons work with health issues that span the entire spectrum of the human nervous system. And, yes. This does include the brain. However, skilled neurosurgeons also work with the skull, spinal cord, vertebral column, peripheral nerves and the extra-cranial cerebrovascular system. Most of the time, a neurosurgeon may have no need to operate. He/she may instead provide equally effective non-surgical care. But, when the situation requires a surgical solution, even one that is minimally invasive, expert level training is paramount. Practicing neurosurgeons (and students, as well), have been challenged in recent years to stay abreast of fast-breaking changes in surgical techniques while simultaneously maintaining certification requirements in an environment where limitations in residency training hours are increasing. Success as a neurosurgeon demands competency with precise tools and instruments. It requires the ability to negotiate complex anatomy and the skill to assess the anatomic relationships between neural and vascular structures encased by bone. This proficiency is mastered through dedicated practice and professional training. 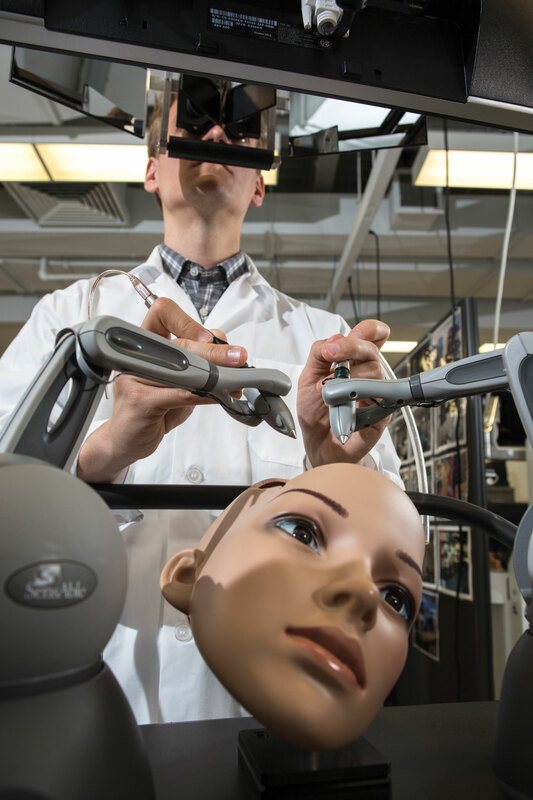 In a successful effort to fill this crucial training need, the NeuroVR (initially manufactured by the National Research Council of Canada and now sold and distributed, worldwide, by CAE Healthcare) was developed to elevate neurosurgery to a new level. With life-like renderings of brain tissue, blood vessels, and tumors, realistic sounds and superior tactile feedback, the NeuroVR stands as the world’s most advanced virtual reality simulator for neurosurgery. Both surgical residents and seasoned neurosurgeons can use the NeuroVR to practice, make errors, and perfect their skills in open cranial and endoscopic brain surgery with no risk to actual patients. By generating realistic endoscopic views (including lens distortion effects, blurring, and tissue deformation), the NeuroVR creates a stunningly true-to-life learning environment for progressive training. In fact, the NeuroVR permits adjustments in levels of training difficulty that allows for performance measurement and assessment of the learning curve for different levels of trainees. If you are a neurosurgeon with trainees or seeking to upgrade your own skills, contact CAE Healthcare for more information about NeuroVR. Surgical residency programs and others with similar needs and interest in acquiring up-to-date skills in the latest neurosurgical protocols are invited to reach out as well. Learn more, do more, and get more from the high-quality simulation-based training available with CAE Healthcare.